Aging dogs show progressive β-amyloid (Aβ) deposition within the walls of small cortical and leptomeningeal arteries and develop cerebral amyloid angiopathy (CAA) that is morphologically identical to human CAA associated with Alzheimer’s disease and with aging. The canine and the human Aβ amino acid sequences are identical, which is an essential requirement for an animal model of β-amyloidosis, because subtle changes within the Aβ peptide sequence may impredictibly change its aggregation properties. 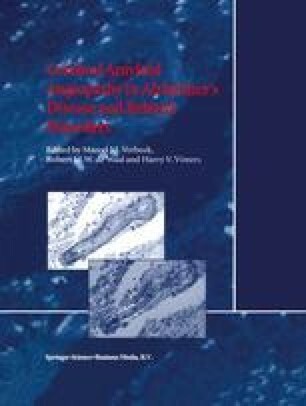 Since cerebrovascular Aβ deposits are always closely associated with vascular smooth muscle cells (SMCs) or the SMC-related parenchymal pericytes, primary canine cerebrovascular SMC cultures have been used to investigate the molecular mechanisms underlying the development of cerebrovascular Aβ deposition. This review summarizes the results obtained with canine SMC cultures and discusses their potential implications for the pathogenesis of CAA.